After working at a cosmetic counter for nearly 10 years, I was great at advising people how to transition their daytime makeup looks to night with quick and easy steps. While I still stay connected to the beauty industry through my blogging, I don't work in it day to day so I love going to department store counters from time to time to explore, get my makeup done, play with new looks/new colors and freshen up my makeup application techniques. 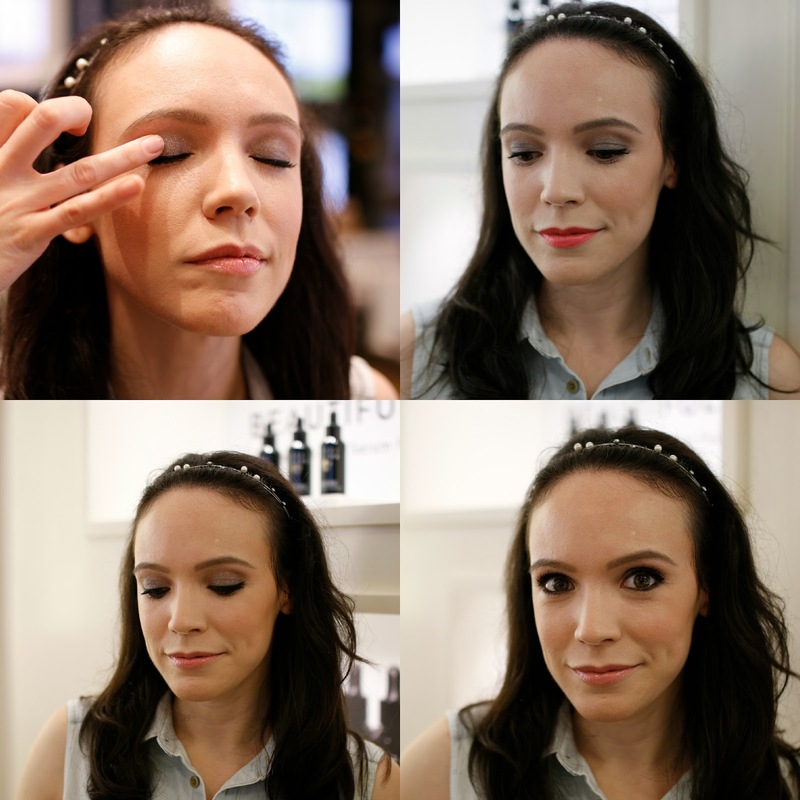 Bobbi Brown is one of the makeup brands that offers a TON of different options for makeup application, makeup lessons or just plain knowledge. Typically they are complimentary, though the former counter girl in me can't help but walk away with a few purchases. If you want to know the truth, I learned how to do my makeup long before working at a counter just by going to the ones near my house in college and having them do my makeup any time I wanted to pick up new things. My favorite sales girl would do one eye, and then let me do the other so she could critique me as I went along. It was quite empowering. 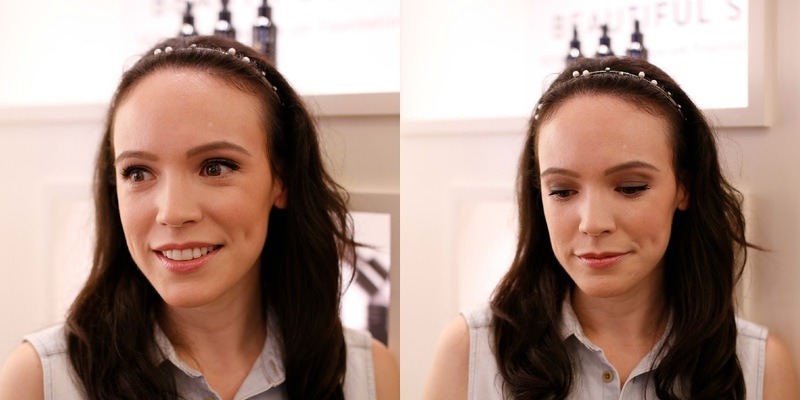 When I popped by the Bloomingdale's 59th Street Bobbi counter, I decided to have them do a full makeup lesson on me because I wanted to try out some new colors and products from the line. Surprsingly, I have never worn a Bobbi foundation so I needed to choose my color, and naturally it turned into a full face. Ha! My husband was with me as I had promised him lunch after (food bribery always works), so I had him take some pictures of all the finished looks because they looked so great. In addition to the full makeup lesson, all Bobbi counters offer a ton of other quick options as well such as smokey eyes, brow tutorials, cheek and lip tutorials and quick 5 minute makeup refreshers. Next, I wanted her to take my look from day to night so we played around with three different ways. 1. For a quick transition, we added a shimmer shadow in the color Smokey Quartz. My artist applied it by pressing the shadow onto the lid on top of the shadow stick I was already wearing. 2. Next, for a bolder step, I wanted to add a bright lip because I adore the look of a strong eye and lip for evening. We were deciding between a few different shades, but I felt that with the summer coming, I wanted a vibrant fun lip so we added on this neon orange lipstick called Coral Gables. 3. For a third evening look possibility, we wiped off the Coral Gables lip, added the lipstick Bare Pink (which is seriously one of the best nudes I've ever tried!) and a lip gloss in Almost Pink. Then taking the shadow stick that was used on my eye lids, we lined my lower lash line and took the gel liner inside the water line for an intense smokey look. I have to say, I walked away from the counter much more inspired than I've been in a while and I remembered how creative I used to be with my makeup. Even though the shades are simple and neutral, it's good to switch up how I wear them and bring back some of my old artistry skills I have laying dormant. I know applying makeup can seem daunting but coming from a gal that has not a single artistic bone in her body, cosmetic counters can be a wealth of knowledge and are one of the best places to learn and practice. When is the last time you got your makeup done? How did you learn to do your makeup? grey with orange is an unusual, but great combination! You look beautiful! I very rarely get my makeup done at a counter, the last time was at Giorgio Armani counter as I wanted to try out Luminous Silk. Unfortunately the guy was not that great at application and sadly I walked away without. But I do love getting my makeup done, a friend of mine is a MUA and she always does a beautiful job. Your night eyes - perfect! !